Murphy as Blue Jays first base coach, 2009. Dwayne Keith Murphy (born March 18, 1955) is a former Major League Baseball player who spent most of his career playing for the Oakland Athletics as an outfielder. He was the first base coach for the Toronto Blue Jays during the 2013 season, and retired after that season. Murphy was drafted by the Oakland Athletics in 1973 and made his Major League debut in 1978. He spent nine years with the Athletics and played under managers, Billy Martin, Sparky Anderson, and Tony La Russa. The A's made the playoffs in 1981, where they lost to the New York Yankees in the American League Championship Series. In those playoffs, Murphy hit .421 and hit one home run in six games. Murphy's biggest offensive year came in 1984, where he hit 33 home runs and drove in 88 runs. Murphy also drew many walks which led to a very high on-base percentage, and had excellent speed on the base paths. He stole 26 bases in both 1980 and 1982. He was also one of the best defensive outfielders of his time, receiving six consecutive Gold Gloves from 1980 through 1985. Murphy had a signature play where his hat blew off his head virtually every time he made a spectacular catch. It occasionally even happened on routine fly balls and it eventually became Murphy's trademark. During most of his career in Oakland, he batted second in the lineup behind hall-of-famer Rickey Henderson. Henderson credits Murphy for helping him set the single-season stolen-base record of 130 steals in 1982. Murphy finished his career with 166 home runs, 609 runs batted in, a .356 on-base percentage, 100 stolen bases, and 6 Gold Glove awards in 1360 games. After retirement as a player, Murphy became a coach with the Arizona Diamondbacks from 1998 to 2003. He was the Diamondbacks' hitting coach when they won the World Series in 2001. In 2005 and 2006 he became hitting coach for the Syracuse Skychiefs, the Triple-A affiliate of the Toronto Blue Jays. He was promoted to first base coach for the Blue Jays in 2008 when manager Cito Gaston took over for John Gibbons. Murphy was born in Merced, California, about 120 miles from Oakland. After graduating from Antelope Valley High School in Lancaster, California, Murphy was drafted in the 15th round in the 1973 draft by the Oakland Athletics, after turning down a football scholarship from Arizona State University. He came up to the majors for the first time in 1978 at age 23. He would spend the large bulk of his career with Oakland. Murphy struggled in his rookie year. While he only played in 60 games that season, he managed to collect just 10 hits in 52 plate appearances (giving him an .182 batting average) and he did not hit a home run. His numbers improved as he became the A's everyday center fielder. His power numbers grew as well. The Athletics in the early 1980s had an outfield of Murphy, Rickey Henderson, and Tony Armas, and many fans saw it as the best young outfield in baseball. Murphy hit second in the lineup throughout most of his career with the A's batting behind Rickey Henderson. Henderson credits Murphy for helping him set the single-season stolen-base record of 130 steals in 1982. After Henderson stole his 119th base that season, he pulled the base up out of the ground and kept it. Afterwards, in an interview, he said, "If I could break this base in half, I'd give the other half to Dwayne Murphy." Murphy also credits Henderson with helping him have a good career. "I took a lot of pitches for him", Murphy said. "He made my career, I believe, because I let him steal and that put me in a position to knock in runs. I loved to watch him play. Let him steal second, let him steal third, knock him in. It gave me a respectable career." Like Henderson, Murphy also had good speed. He stole 26 bases in both 1980 and 1982. He also had good power numbers. His biggest offensive year came in 1984, when he hit 33 home runs and drove in 88 runs. He was one of the best defensive players in the game, winning an incredible six straight Gold Gloves from 1980 to 1985. His signature play became a trademark of sorts for him – his hat blowing off his head on virtually every play he made, from tracking down routine fly balls to making spectacular catches deep in the Valley. After nine years in Oakland, he spent his final two seasons with the Detroit Tigers and Philadelphia Phillies. He played in 49 games with the Tigers in 1988, hitting .250 and hitting four home runs. In his final season with the Phillies, he hit just .218 and hit 9 home runs. In 1990, he joined the Yakult Swallows in Japan. Injuries limited his effectiveness, and the Swallows released him in August. Following his playing career, Murphy began a coaching career. He coached with the Arizona Diamondbacks from 1998 to 2003, including serving as hitting coach in 2001, when the Diamondbacks won the World Series. In 2005 he was hired by the Toronto Blue Jays as a hitting coach, first for the Blue Jays' triple-A affiliate, the Syracuse SkyChiefs, and then later as a "roving" instructor, visiting all the team's minor league clubs to help players with hitting. He held that position when he was named the team's first base coach on June 20, 2008, in the wake of Cito Gaston's nomination to replace the fired John Gibbons as Blue Jay manager. Blue Jays' outfielder Adam Lind has an intimate relationship with Murphy, "He keeps me loose", Lind says. "He can dish it out and take it, too. Some coaches you have more of a formal, professional relationship with. With him, you have fun. He talks about how good he was, and I tell him how bad he is. Yeah, he had a good career. At least that's what he keeps telling me." 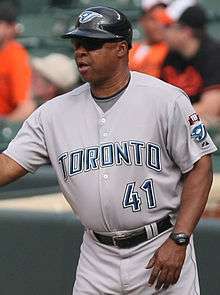 On October 30, 2009 he became the Blue Jays' hitting coach, following the retirement of Gene Tenace. On November 24, 2012, Murphy was appointed as the Blue Jays' first base coach and outfield coach when Chad Mottola became their hitting coach. Murphy retired following the 2013 season. ↑ Davidi, Shi (November 26, 2012). "Gibbons names five to Jays coaching staff". Sportsnet.ca. Retrieved November 27, 2012. ↑ Robinson, Alan (June 20, 2008). "Blue Jays fire manager Gibbons, rehire Cito Gaston". USA Today. ↑ Lott, John (October 7, 2013). "Toronto Blue Jays' coaching shakeup: Chad Mottola dismissed, Dwayne Murphy retires". National Post. Retrieved October 7, 2013. This article is issued from Wikipedia - version of the 3/17/2016. The text is available under the Creative Commons Attribution/Share Alike but additional terms may apply for the media files.